What follows is a list of the main concepts of storytelling which are useful to think about in relation to how they apply to the shaping of your story. By the time you get to the documentary paper edit stage you are dealing with is a sort of “reversed script". where from the material is given to you, you have to find the best way to put it together. but how? The exciting incident is the event or decision that begins a story’s problem. What is the exciting incident in your story that sets the narrative in motion? Exposition, it’s giving away, “who”, “what”, “where”, “when”, and “why”, the audience needs to know, when the audience needs to know it. It’s a powerful tool to strengthen the story, and temporary withdraw information to grab and focus attention. The Arc refers to the way the story event transform your characters. The Theme is the general underlying subject of a specific story a recurring idea that often illuminates an aspect of the human condition. Plot and/or Character driven story. A character-driven film is one in which the action of the film emerges from the wants and needs of the characters. In a plot-driven film, the characters are secondary to the events that make up the plot." I like to shape principles not apply formulas, because if you understand the principles of story telling you can deal with most circumstances, and make informed decisions rather then following formulaic prescriptions. So bare in mind that what follows is not a formula to work with, what follow is an example of how you could prep the story structure that suits your narrative to help your paper edit. 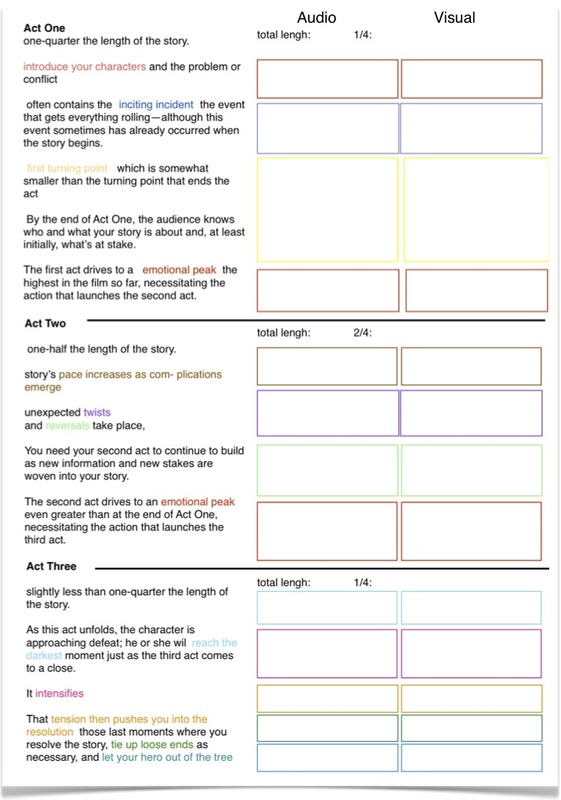 A 3 act structure where act 1 and 3 are 1/4 of the whole. ie for a 20min short doc, it would be 5 min each, and Act 2 about 1/2 of the whole, so a round 10min in our 20 min example. Inciting the incident, the event that gets everything rolling although this event sometimes has already occurred when the story begins. First turning point, which is somewhat smaller than the turning point that ends the act. By the end of Act One, the audience knows who and what your story is about and, at least initially, what’s at stake. The first act drives to an emotional peak, the highest in the film so far, necessitating the action that launches the second act. You need your second act to continue to build as new information and new stakes are woven into your story. The second act drives to an emotional peak even greater than at the end of Act One, necessitating the action that launches the third act. As this act unfolds, the he or she will reach the darkest moment just as the third act comes to a close. It intensifies. That tension then pushes you into the resolution, those last moments where you resolve ties up loose ends as necessary and “let your hero out of the tree”. Here is an example of how you work it into a template to help the thinking over the events of your story. download this template: doc, pdf, pages, Google Doc Spreedsheet . However as mentioned above this is not a formula, the structure of your story should serve it's content. If you want to use a different structure you can read "The Seven Basic Plots" book and work from one of those, or use it for inspiration as a starting point and make your own. Last but not least remember that is once you know the principles that you can master the art. The 3 Act Structure template as: doc, pdf, pages .